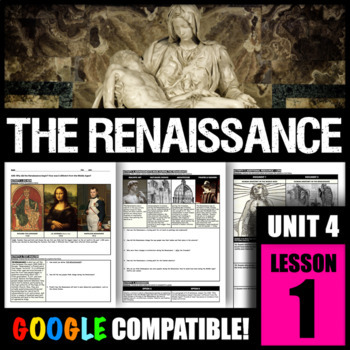 Why did the Renaissance begin? How was it different from the Middle Ages? ACTIVITY 1 -- DO NOW: Students will analyze three portraits. One from the Middle Ages, one from the Renaissance, and one from today. Students should determine which portrait had the biggest impact on the art world in the past 1,000 years. They should answer the Mona Lisa because it was completed in a time when realistic features suddenly became valued. ACTIVITY 2 -- TEXT ANALYSIS: Students will define the Renaissance and read about what the word means and how it changed people's ways of thinking. ACTIVITY 3 -- THINK-PAIR-SHARE: Students must work in pairs to analyze advancements in art, science, architecture, and theatre/fashion. 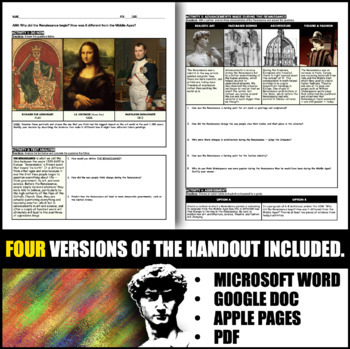 ACTIVITY 4 -- CRQ: Students will analyze a CRQ to compare and contrast the Middle Ages to the Renaissance. 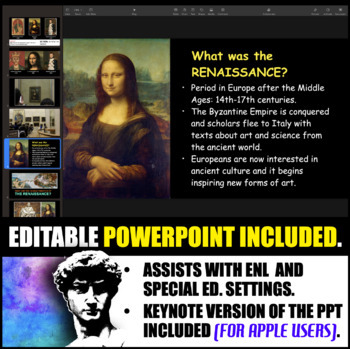 ADDITIONAL RESOURCE INCLUDED: PowerPoint with photos of Renaissance achievements. Some of my own photos are posted.